There is no known estimate as to how many people bite their nails. Maybe this is because many people do so for periods of their life, but cease to do so later (nail biting has been found to be more common in teenagers, for instance). One thing is clear, however: Most people recognize that nail biting is not a desirable trait, some even go so far as to say the habit can prove dangerous. As a dentist’s office, we have a unique angle on the issue of nail biting. The damage to the crowns of teeth, including chipping, wearing, and irreparable enamel erosion is immediately evident among those that bite their nails. Beyond even the tooth damage, however, there are numerous other reasons that nail biting can be bad for your oral and overall health – not to even mention the sociological harm it can do to your image among peers. The bacteria present in your mouth is constantly combated by your saliva, which naturally balances the potentially harmful effects of these bacterias. If left under your fingernails, however, these bacteria will grow and intermingle with bacterias present there and create an even more potent cocktail of bacterias that will likely end up right back in your mouth when chewing on your fingernails the next time. This back-and-forth exchange of external contaminants found under your fingernails and within your mouth promotes the exponential growth of these nasty bacterias. Regardless, even if we think of the one-way exchange of bacteria and contaminants caught under your fingernails into your mouth, there is more than enough potential to make yourself sick or create a bacterial breeding ground in your mouth – yuck! While our dentistry is primarily concerned with your teeth, the damage goes both ways when you regularly bite your nails. By chewing your fingernails, you can create an uneven growth, give yourself hangnails, and even create crooked nails that can become painful or even require surgery to remove. In some cases, you can even cause infection to grow within your cuticle or under your fingernail, which can become extremely uncomfortable and require a visit to the doctor’s office for antibiotics or surgical treatment. The damage to your teeth is often worse, however. While chewing your nail, it may seem like your teeth always win out in the battle of hardness, but your fingernails grow back rapidly – your teeth don’t grow back at all. Basically, your teeth are slowly losing the fight against your nails, and every encounter leaves your teeth a little worse off than they were prior. As mentioned above, your teeth were not made for crunching through or gnawing on something as hard as a fingernail regularly, so the damage to the tooth’s enamel and crown itself can be quite significant. While biting your fingernails may not chip your tooth directly, it is quite possible that the teeth you use for this activity will be more likely to succumb to crown-related injuries, such as chipping, fracturing, cracking, or breaking; most people use the teeth in the front of their mouth for this activity, which makes this detriment twofold. 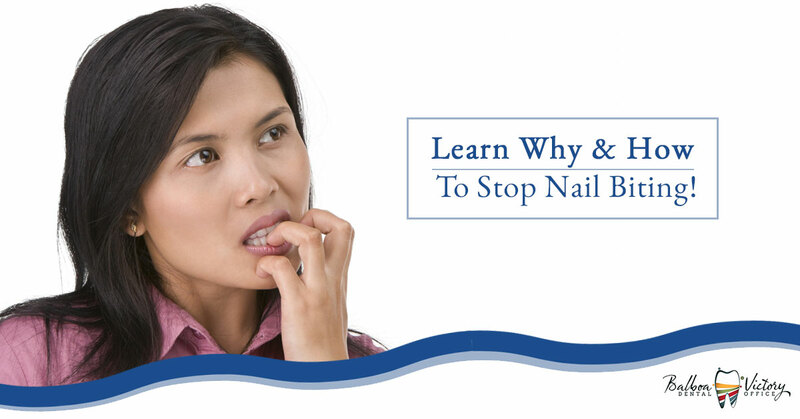 Treating the underlying stress or anxiety that typically causes nail biting instances. Many people bite their nails purely out of stress or anxiety, often without even realizing it, so treating these conditions with therapy or medication can make it much easier to quit the habit outright. Occupying hands and/or mouth can also be extremely effective. Those comfortable with a manicure can use maintaining their nails as a welcome way to remind and encourage them to avoid the chewing, for instance. Many people take up gum-chewing (preferably sugar-free gum!) or occupy their hands with a fidget of some sort. Applying distasteful chemical “nibble inhibitors” to your fingernails is another great solution, as it simply makes your nails taste bad. This easy-to-implement solution requires only a quick application a few times a day to make you feel less inclined to partake in this habit. Alternatives to this could include using bandaids or wearing gloves, although this could get you a few odd looks! Whatever manner you choose to employ, there is plenty of support out there to help you. This habit is shared by millions of people, so information and general support can be found online and in-person through numerous channels, should you choose to look. In any case, you’ll be happy to no longer have to hide mangled nails or worry about chipping a tooth! Get in touch with the friendly staff at Balboa Victory Dental with any questions you may have about our dental care, practices, and even advice for developing better oral habits – we love to answer those questions! At the end of the day, our entire staff just wants to assist your family find the dental care that is best for you, so we’re truly happy to help in any way. Learn more about our dentistry and insurance options, then schedule with us today!